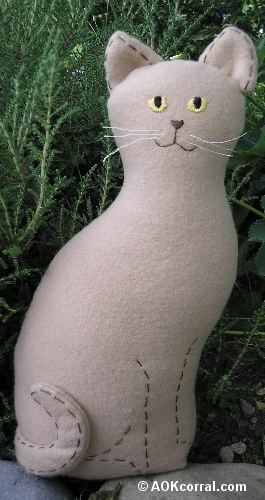 This pattern makes a fun and lovable cat doll. Our stuffed cat is easy to make. The cat is sitting and can be made in cat colors or fun print fabrics. This cat's finished measurements is approx. 12" tall and 6" wide. Fold the fabric wrong sides together and pin the pattern pieces onto the fabric through both layers. Cut them out. Take out the pins and remove the piece of fabric that will be the cat body back. Take the cat body front and pin the pattern back on. Make thread markings at each of the dots located on the leg guidelines and at the tail position. To make thread markings: Thread your needle and do not tie a knot. Send your needle down through one side of the dot along the guideline and then back up through the other side of the dot. Make more thread markings around the eye and at the nose as needed to help you find the correct placement when embroidering. Embroidery the nose and mouth onto the cat face following any placement thread marks that you made. 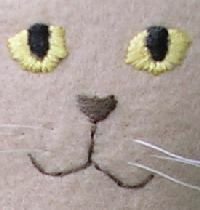 To make the eyes, take your interfacing and lay it over the cat face pattern then trace the eyes with a fine point pen. Cut them out. Position one of the eyes into place on the face and use a satin stitch to fill in the eye colors. Thread your needle with a piece of fishing line that is about 3 inches long. Send the line into the cat’s face for a whisker and pull about halfway through. Behind the cat body front, make a knot in the center of the piece of fishing line and then send the other end through the other side of the face for another whisker in the front. Repeat these last 2 steps to create another couple of whiskers. Trim ends if needed. 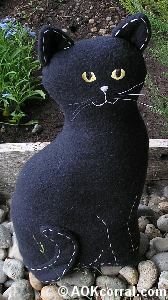 Embroider the leg lines onto the cat front by following the thread markings. Use a running stitch in the contrasting floss color for these lines. Match the tail pieces right sides together and secure with pins. Stitch the cat’s tail together along the stitching lines and remove the pins. Clip the seam allowances all the way around the tail every ¼ to ½ inch, especially around the tip curves. Turn the tail right side out and make sure the edges are flat. Match the ear pieces right sides together and secure with pins. Stitch each of the cat’s ears together along the stitching lines and remove the pins. Clip the seam allowances all the way around the ears. Turn the ears right side out and make sure the edges are flat. Embroider a running stitch with the contrasting floss color about ¼ inch from the edges of the cat ears. Your stitches should only go through the front sides of the ears. Lay the cat body front out in front of you. Lay the cat body back onto the body front with right sides together and pin together. Carefully stitch together the cat body along the stitching lines (approx. ¼ inch from edge). Secure the beginning and ending spots by stitching back and forth an extra time. Clip into the seam allowances every ½ to 1 inch around all curves and at all turning points. Turn the seam allowances inside at the opening of the cat body and stitch the openings together with small stitches in the matching thread color for the cat. 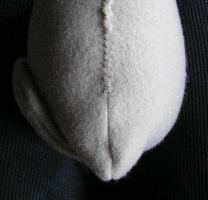 Attach the tail against the body with some stitches that are hidden through the backside of the tail and the body. Turn ¼ inch of the opening of the ears to the inside, stitch the opening closed with small stitches in the matching thread color. 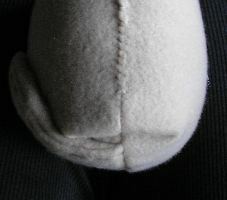 Position the ear onto the head just behind the top seam and with the inner edge of the ear about ½ inch from the center of the cat head. As you put the ear into position slightly fold the left and right edges of the ear in toward each other to form an inner ear. Stitch into place using small stitches. Fun for the child (or adult) that loves cats!